This was such a culinary miracle for me! Making the marinara from scratch is a taste game-changer. Follow my recipe here! This traditional Italian recipe is laborious by nature, but WAY worth the effort. If you’ve never made vegan parmesan cheese before, I highly recommend making it! Follow Minimalist Baker’s recipe here. After using this in the Eggplant Parmesan, you can continue using it as a seasoning for avocado toast, salads, popcorn, fried tofu– really anything you would want a parmesan flavor in. I hope you love my recipe as much as I do! Prepare each round in this order-- dredge in flour, then dip in thickened coconut milk, and coat in the breadcrumb/parm mixture. When each round is coated, place in a large skillet on medium heat that has plenty of oil in it. These battered eggplant slices will absorb a lot of oil while they get crispy! Have a tray lined with paper towel to place the finished eggplant rounds on so they may "drain" some of the excess oil. When all of your rounds are browned and crispy, prepare an 8x8 deep baking tray. 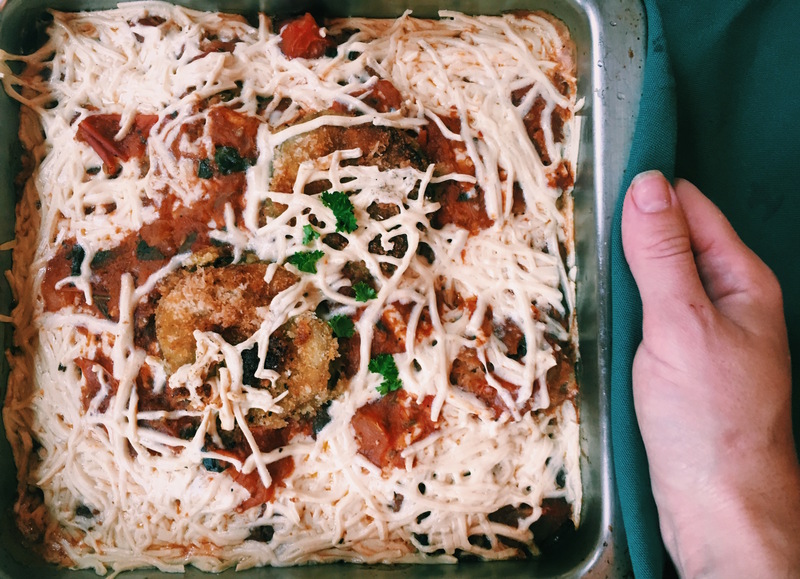 Coat the bottom with marinara, then lay your rounds along the bottom slightly overlapping, then cover with more marinara and plant-based cheese. Repeat this process as needed until all of your eggplant rounds are gone! Bake covered for 30 minutes, then uncovered for 5 minutes.